A warm welcome to you. This website is intended to be a source of information and interest for those who enjoy playing and collecting chess computers. My own collecting interest is focused mostly on the early years. 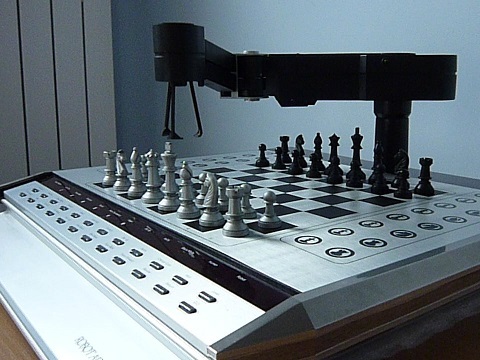 When chess computers first made their appearance through to the time they became strong enough to regularly beat club players. Broadly speaking the first ten years, 1977 to 1986. I also collect wooden auto sensory chess computers, robot chess computers, strong chess computers and anything else which particularly takes my fancy. In time there will be more features here filling in some of the gaps in the information available on the web. In early 2007 a SciSys section was added, and in Spring 2008 a detailed feature covering all the Rare chess computers in my collection and the start of a Repairs section. A feature on the UK contribution to chess computers and a Patents section were added in 2009. In 2011 a Publications Archive was stocked with magazine articles from 1978 to 1986, plus Computer Chess Digest and Computer Chess Reports. In 2016 all 166 issues of Selective Search (1985-2013) in pdf format joined the archive. Lastly a Strong section concentrating on the strongest chess computers in the collection is under construction and due for completion in 2019. The Timeline is an original feature of the website. It is continuously updated to include all of the chess computer models (currently approx 700) for which I have a release date. Check out my Sale & Swap pages. I usually have one or two sales each year. And if you are searching for a manual or other information please try the Links page.